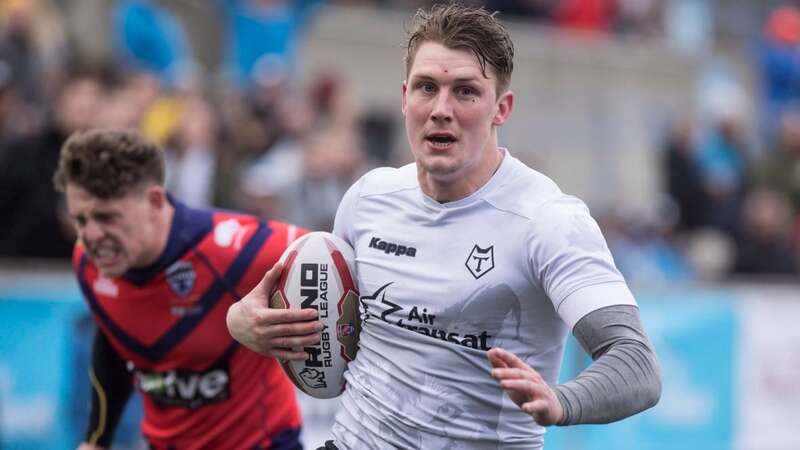 The first-year Toronto Wolfpack moved up the English rugby league ladder Saturday, defeating a tough Barrow Raiders side 26-2 to secure promotion to the second-tier Championship with one game remaining in the season. Eighteen unanswered second-half points secured the victory that assures Toronto (19-1-1) of the Kingstone Press League 1 title and the automatic promotion berth that comes with it. ​Barrow (17-3-1) made the Wolfpack work for everything for the first 50 minutes before a season-high attendance of 7,972 at a sunny Lamport Stadium. But Toronto pulled ahead with converted tries in the 53rd, 55th and 59th minutes as holes opened in the tiring visitors’ defence. A showdown between No. 1 and No. 2 teams in the third-tier league, it was a hard-hitting contest with more than one player left wobbly by a huge hit, some of which were illegal. Toronto can thank its defence for resisting numerous early Barrow attacks after an error-strewn start. Blake Wallace scored two tries for Toronto while Quentin Laulu-Togaga’e and Richard Whiting added singles. Captain Craig Hall had four conversions and a penalty. Lewis Charnock kicked a penalty for Barrow, which was beaten 70-2 on its May visit to Canada.